Matchbox made the Mobile Action Command figures in the '70's, when I was but a wee lad. I don't know how old I was when I started playing with these figures and their playsets, but I remember I loved them. The guys were small and I was young enough to appreciate that on a very basic level. I was small too, you see. For years I tried to figure out what they were until I stumbled upon their name on Plaid Stallions. 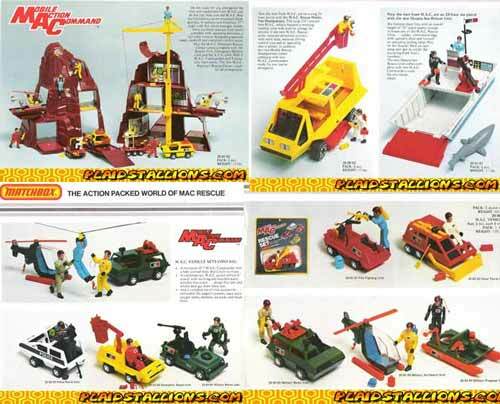 I remember playing with these guys for hours and like the Adventure People, the playsets were geared less toward conflict and more toward rescue. That resonates very deeply with me still, even though I love playing "war".